Happy Easter / God Påske. Kristus er oppstanden! Ja, han er sannelig oppstanden! Halleluja! Looking forward to our Easter services. The only down side is that the clocks go forward . . .
Part of our recent busyness has been preparing for Påskefestuke 2016 – our Easter festival week. 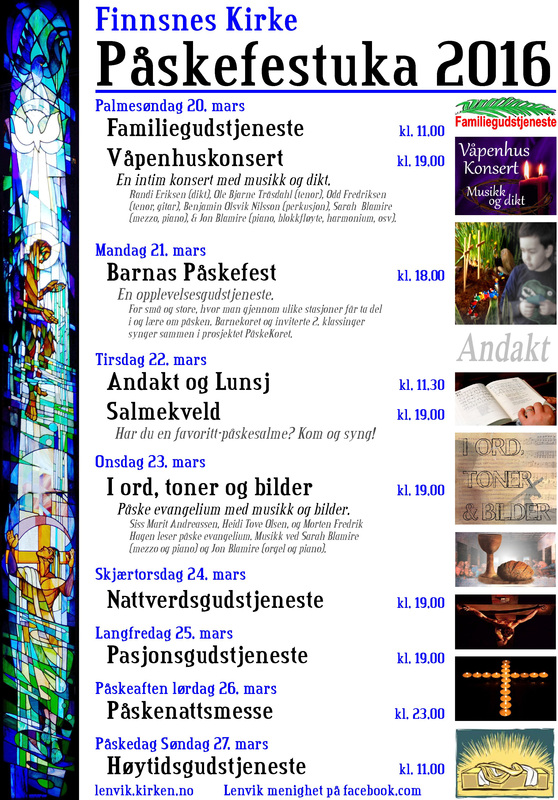 Påskefestuke is something we inherited from previous kantors here in Finnsnes, and consists of a variety of cultural events, in addition to the usual service for Holy Week (Palm Sunday / Palmesøndag, Maundy Thursday / Skjærtorsdag, Good Friday / Langfredag, Holy Saturday / Påskenatt, and Easter Day / Første Påskedag). Back in the hayday of the Norwegian Church, there was lots of money and often the cultural events were hired in, but now there is no culture budget, so it’s down to Sarah and I, plus volunteers, to whom we are extremely grateful. The festival brochure can be downloaded here. We’ll write about the individual events soon – in case you’re in the area and have time to drop! There’s not been much opportunity for skiing so far this year, so when we got a window of nice weather and a couple of hours free, it was off on Tortenlirunden, a circular ski trail on Senja, about 8 km / 5 miles. The name is cunningly derived from the name of the hill (Tortenli, which we walked up last autumn) which the trail goes around (runden)! I cheat a bit and take the popular ‘short cut’ across the frozen lake, which is guaranteed flat! 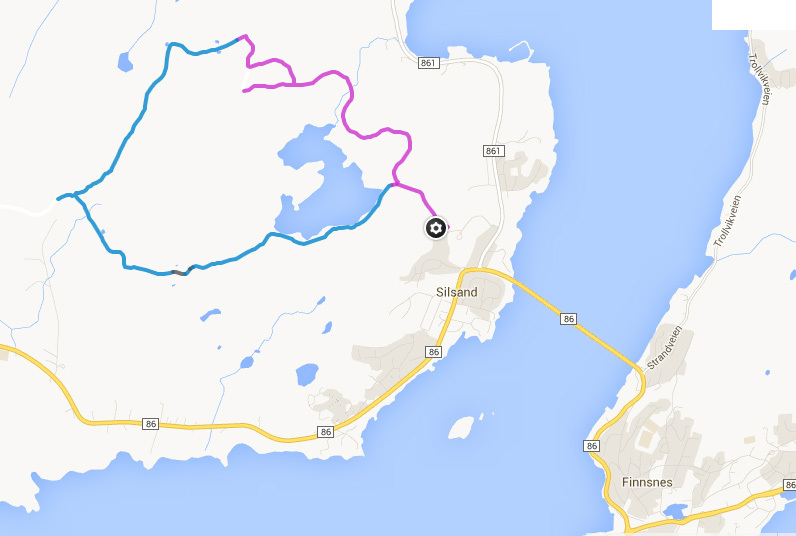 This map comes from a useful website which shows ski trails, which are colour coded to show the last time the snowmobile went round to maintain them. The trail begins to head back ‘inland’ (north east) and we say goodbye to the sea for the next portion. Sorry that the gaps are getting bigger between blog posts have been rather long. Things here have been super-busy, even by our standards. They include, a concert tour to England with our children and youth choir, and leading an Alpha course for arabic speaking Syrians (it’s a long story . . . .). This, combined with a very ‘grey’ winter has given little visual to blog about. 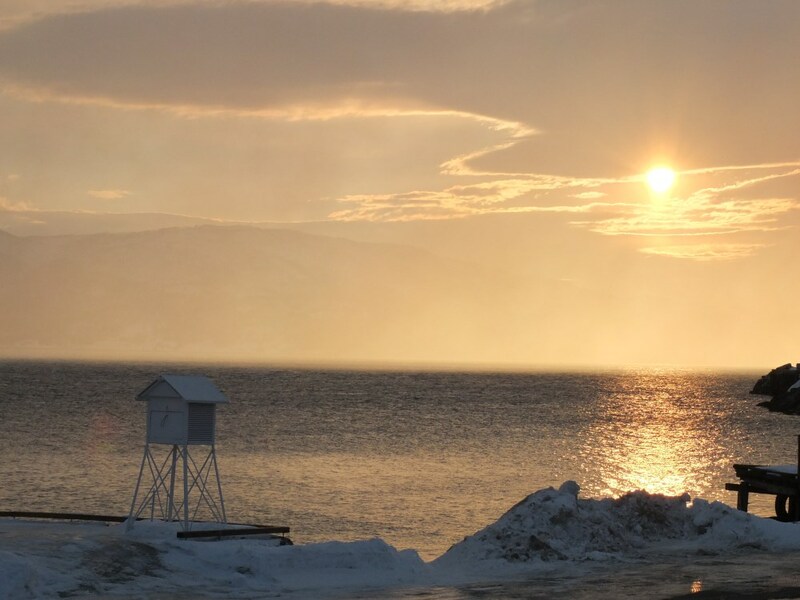 A couple of weekends ago people in Finnsnes began commenting that on an otherwise sunny day there was a thick haze, the like of which they hadn’t seen before . . . The local smelterverk seemed to be having problem with it’s filtration system. Not very environmentally freindly, but a good excuse to quote Deep Purple.